It has taken almost 33 hours of poker to reach a winner, but finally after besting 3,220 other players Will Jaffe is your Event 54: $1,000 No-Limit Hold'em winner. Jaffe came right out the gates to start the day, managing to chip up to a strong lead. It seemed like nothing could stop Jaffe early on, but an untimely river card sling-shotted Luis Campelo back into contention. After the river dropped Campelo's crowd exploded in glee and shock. After Campelo's miracle river card players were essentially even and the two competitors went back to grinding it out. Pots remained small with each player worried of losing a single chip, but a big hand late in the game pushed the advantage in Jaffe's favor. Both player's respective crowds may have been the biggest attraction of the day with Campelo's Brazilian groupies creating unique and loud cheers. Compared to day 3 though the Brazilian crowd seemed a bit tamed. Jaffe's crowd stepped it up though with plenty of loud boisterous yells of excitement every time Jaffe took down a pot. Once Campelo got low each player seemed to trade off moving all in and folding. Eventually Campelo moved all in from the button and was snap called by Jaffe from the big blind. Jaffe held , while Campelo could only muster up . he flop came prompting a monsterous cheer from Jaffe's crowd. The on the turn brought an even loud roar. The fell on the river and Jaffe had the best of it. 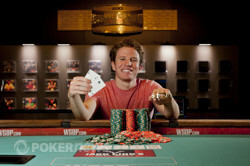 Congratualtions to Will Jaffe on his first World Series of Poker bracelet, and his $500,075 pay day. 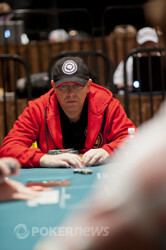 Will Jaffe wins the WSOP Gold Bracelet in Event 54. He had to come back for a 4th day to claim it against Brazilian Luis Campelo. The now short stacked Luis Campelo moved all in from the button and Will Jaffe quickly made the call from the big blind. The flop came prompting a monsterous cheer from Jaffe's crowd. The on the turn brought an even loud roar. The fell on the river and Jaffe had the best of it. Campelo finishes the day in second place and takes home a $309,429. Play has changed from making it 400,000 from the button every hand, to folding the button or moving all in with both players trading off the blinds and antes. Luis Campelo raised it up to 400,000 from the button and Will Jaffe came along for the ride from the big blind. The flop came prompting a check from Jaffe, and a bet of 450,000 from Campelo. Jaffe quickly made the call and we were off to the turn. The then made an appearance on fourth street and both players knuckled the felt for checks. The on the river allowed for Jaffe to bet out 825,000. Campelo made the call and Jaffe flipped over for two pair. Campelo mucked and Jaffe took the pot. Will Jaffe just raised it to 400,000 from the button and and Luis Campelo announced raise from the big blind. Jaffe folded and Campelo took the pot. Players are now set up on the Pavilion Stage, and play has consisted of both players trading off turns raising on the button and taking down the pot.